FTTH « Global Market Insights, Inc. In world being blitzed with emerging applications that include Internet of Things, 5G network and 4K video streaming, GPON market is expected to find immense growth opportunities over 2018-2024. For instance, earlier in 2018, SK Broadband of South Korea announced that it will be launching high-speed internet service that will be capable of delivering 2.5 gigabit per second. The service will allow users to download high volumes of content using multiple devices while the service will be 3 times faster than most of the South Korean internet services that are already quite fast. The technology at the basis of making this possible is Gigabit Passive Optical Network or GPON and while SK Broadband’s current coverage is 40%, the company plans to invest 1 trillion won and expand up to 80%. Korean rival KT is also planning to roll out similar services and the South Korean government is also planning to roll out 5G wireless internet in 2019. With such developments not being bound to South Korea alone, it is predictable that the GPON market will witness significant growth in the ensuing years. The world, currently replete with an increasing number of connected devices and robust development in machine to machine communication, is swiftly preparing itself to implement 5G technology. The only viable way to benefit from such emerging applications is by having the right network backbone in place – which paves the way for the growth of GPON market. According to reliable statistics, the global IoT market nearly doubled in size between 2014 and 2017. There were nearly 23.14 billion IoT devices in the world in 2018 which is estimated to cross 31 billion by 2020. The global IoT market is anticipated to register its name in the trillion-dollar industry space by 2019 with 20.35 billion devices across the globe as smart, connected cities that will be using connectivity, communication technology and information to solve urban problems deploying IoT for the purpose. With IoT market having already chronicled its name in the billion-dollar vertical, IoT proliferation is further expected to add to the growth of the GPON industry. Speaking of IoT it is imperative to mention the onslaught of 5G networks and their support in bringing a whole new dimension to the GPON market. the business world is looking forward to the adoption of 5G as when it is becomes a widely used reality, 5G is poised to become a disruptive force. Applications such as virtual reality, augmented reality, artificial intelligence and telepresence, that have been built on underlying technologies are expected to benefit from massive data pipes and ultra-low latency. While industrial automation and robotics will become a reality, cars and drones will become capable in communicating with each other taking machine to machine communication to a whole new level. With enhancement in machine communication capabilities it is expected that increasing innovation will further increase the need for better 5G performance and eventually lead to expansive prospects for the GPON market. Notably, NG-PON2 would be the fastest growing segment in the GPON market with a CAGR of approximately 20% over 2018-2024. The emergence and progress of 5G will act as the most important driver for the NG-PON2 segment and this has been underlined by Altice, the international network operator that has announced that it will be expanding its NG-PON2 capabilities as it prepares for disaggregated radio access network architectures and potentially overwhelming data traffic volumes brought about by the advancement of 5G. The operator aims at supporting 5G services with full support for residential, commercial, fronthaul and backhaul service requirements and strategizing to save deployment costs while creating a positive business case for fiber as an enabler of 5G services. 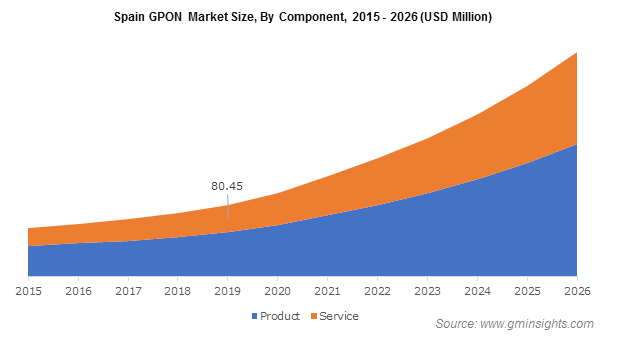 With the demand for futuristic technological development on the rise, GPON market is expected to register significant profits as it becomes the enabler of disruptive forces like 5G network. This entry was posted in Electronics and Media and tagged 2.5 GPON, BFSI, Business, Fiber to the Home, FTTH, FTTX, Government, GPON Market, GPON Market Forecast, GPON Market Share, GPON Market Size, GPON Market Trends, Healthcare, IT & Telecom, Managed Service, Mobile Backhaul, NG-PON2, OLT, ONT, Optical Line Terminal, Optical Network Terminal, Professional Service, Residential, XG-PON, XGS-PON.